Chemical vapour deposition of two-dimensional materials typically involves the conversion of vapour precursors to solid products in a vapour–solid–solid mode. Here, we report the vapour–liquid–solid growth of monolayer MoS2, yielding highly crystalline ribbons with a width of few tens to thousands of nanometres. This vapour–liquid–solid growth is triggered by the reaction between MoO3 and NaCl, which results in the formation of molten Na–Mo–O droplets. These droplets mediate the growth of MoS2 ribbons in the ‘crawling mode’ when saturated with sulfur. The locally well-defined orientations of the ribbons reveal the regular horizontal motion of the droplets during growth. Using atomic-resolution scanning transmission electron microscopy and second harmonic generation microscopy, we show that the ribbons are grown homoepitaxially on monolayer MoS2 with predominantly 2H- or 3R-type stacking. 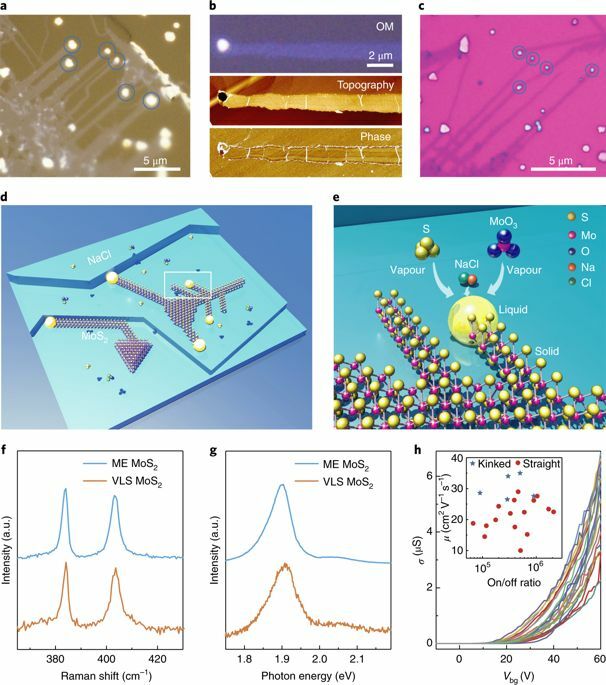 Our findings highlight the prospects for the controlled growth of atomically thin nanostructure arrays for nanoelectronic devices and the development of unique mixed-dimensional structures.